On November 22, 1935, Pan American Airways offered the first regular commercial flight from the US mainland to Hawaii. This first regular air service was a 16-hour flight from Los Angeles to Honolulu. Prior to this air service, the quickest journey to Hawaii from the US mainland took five days by sea. (Source) I wonder if folks back then could imagine that the flight duration would be whittled down to today’s length of only five hours from LAX to HNL? What an improvement, eh? How people entertained themselves for 16 hours without techie gadgets is beyond me. Just kidding, of course. Hope you and Cindy have a great 4th! 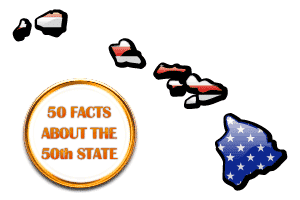 Hawaii Fact 28 of 50: How many people visit Hawaii each year? Hawaii Fact 18 of 50: How Big is Hawaii’s Big Island?